After a long, hot, relaxing day at the beach, the last thing I wanted to do was turn on the oven, stand over a simmering pot, or even think much about dinner. I also needed to use up at least one of my numerous bulbs of kohlrabi. This simple yet elegant dish was the perfect solution. If you are not familiar with kohlrabi, the slaw is a nice way to try it. I prefer it in salads like this one, raw and thinly sliced. Its crunchiness holds up nicely in the vinaigrette so it can marinate for as long as you need it to without losing texture or taste. If you can’t find kohlrabi or are afraid of its UFO like appearance, celery, jicama, or even green apple could be substituted. Combine the slaw ingredients in a large bowl. Feel free to add more vinegar, sesame oil, tamari, lime, salt, pepper and serrano, to taste. Sometimes I add a half cup of mayonnaise for extra creaminess. Toss the slaw gently and refrigerate for at least 30 minutes, preferably an hour. About 15 minutes before serving, heat the oil in a large skillet over medium heat. Season the salmon with salt and pepper. Add the salmon to the hot oil and cook about 8 minutes until nicely browned. Turn the salmon over and continue cooking until cooked through, 3–5 minutes longer depending on the thickness of the fillets. For each serving, mound rice in the center of a dinner plate. 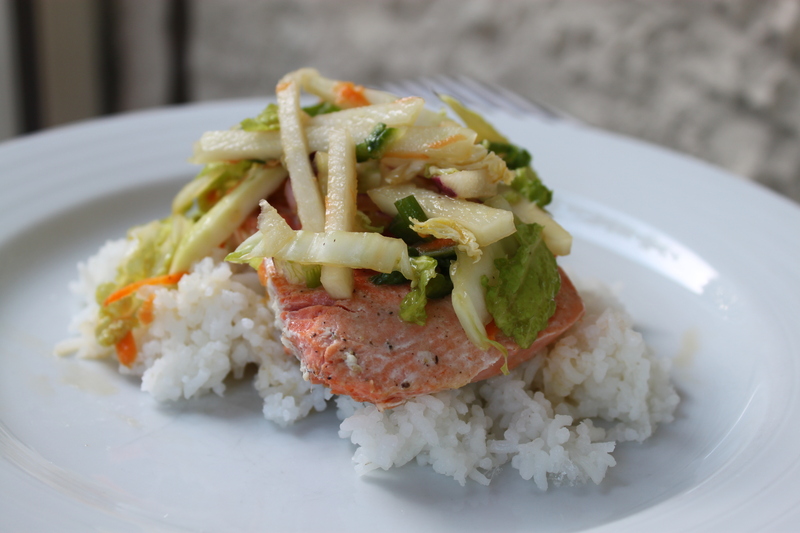 Place a salmon fillet in the center of the rice, then top with the chilled slaw.